#1 Hot New Release in Humor & Entertainment! A heartwarming and funny Christmas to Valentine's Day love story. Jack Hudson has secretly had a crush on Nikki forever. So when she asks his help in securing a last-minute groom, he's conflicted. But where Nikki's concerned, Jack would do almost anything to ensure her happiness. So Jack reluctantly goes along with her plan while trying to put thoughts of them being together out of his mind. With her Valentine's Day deadline approaching, will Nikki settle for another man - or will she start seeing Jack in a new light? A sweet, PG-rated romantic comedy novella. Romance writer Ginny Baird has published novels in print and online and received screenplay options from Hollywood for her family and romantic comedy scripts. She writes touching, often humorous, contemporary romance about single women facing everyday challenges. Known for featuring holidays and family themes in her work, Ginny frequently portrays the struggles of single parents or others who've given up on finding true love. Ginny has two ongoing novella series, The Holiday Brides Series (holiday romance) and The Summer Grooms Series (summer romance), as well as additional single titles available. Ginny's thrilled to have just released her first paranormal romance, The Ghost Next Door (A Love Story), and Book 5 in her Holiday Brides Series, Baby, Be Mine. Holidays featured in Ginny Baird fiction: Christmas THE CHRISTMAS CATCH (HOLIDAY BRIDES SERIES, Book 1) THE HOLIDAY BRIDE (HOLIDAY BRIDES SERIES, Book 2) MISTLETOE IN MAINE (HOLIDAY BRIDES SERIES, Book 3) BEACH BLANKET SANTA (HOLIDAY BRIDES SERIES, Book 4) BABY, BE MINE (HOLIDAY BRIDES SERIES, Book 5) Valentine's Day BABY, BE MINE (HOLIDAY BRIDES SERIES, Book 5) Fourth of July MY LUCKY GROOM (SUMMER GROOMS SERIES, Book 2) Halloween THE GHOST NEXT DOOR (A LOVE STORY) Thanksgiving REAL ROMANCE You can visit Ginny's website at http: //www.ginnybairdromance.com, sign up for her newsletter at GinnyBairdRomance@gmail.com, or connect with her on Facebook http: //www.facebook.com/ginnybairdromance and Twitter @ginnybaird. Ok, so it wasn't a high-brow, over intelligent story. But, it wasn't supposed to be. It was so humorous to see how blind to love, Nikki was and how long suffering her long-time friend Jack was. Nikki was so totally determined when she got a plan in her mind but she did have a heart to help people too. Everyone around her knew Jack had loved her for a long time, she seemed to be the only one that didn't know it or acknowledge it. Oh yes, she thought she had addressed that years ago and Jack was past that. Even adding some of the personal quirks of Nikki's personality was fun to read, something that other people might have too; making her seem more real. Got to admit, Jack was almost TOOO easy going with Nikki and I felt sorry for him. But there were a few surprises here and there just enough to make it interesting. Yes, I know that Nikki was acting more like a teenager than a young woman, but what can I say? I liked it anyway. If you are looking for a romance that will make you smile but doesn't require deep thinking, this is for you. 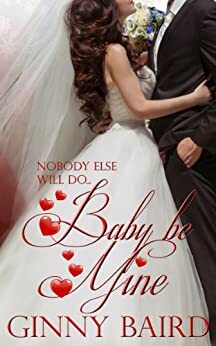 Baby, Be Mine was a fabulous read. Nikki and Jack are great together. It is amazing that a great aunt's will can change the life of two best friends forever. Nikki is bound and determined to follow out her great aunt's will's conditions in order to help her mom and brother have an easier life. She enlists the help of Jack, her best friend to find her possible husband prospects from the guys she has previously dated. Jack goes along with Nikki's plan only to realize that he has loved her since they were kids. Can he convince her that he the is the guy for her? Will she allow them to become more than friends? You need to read this book in order to find out. You will not be sorry. This really is a great book. Enjoy. Enjoyed! I read this as a stand alone, it was a good read 👍. Interesting plot and characters.. Hope you enjoy too! Her Great Aunt Mallory had left her an inheritance. The only problem was she had to be over 25 - check - married by Valentine's day and a baby within a year. No problem except she wasn't going with anyone. A great story told with humor and love.